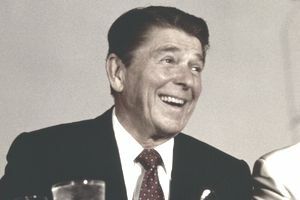 President Ronald Reagan proposed a North American common market in his 1980 presidential campaign. Europe's common market, dubbed the European Economic Community, had already been initiated with the Treaty of Rome. In 1984, Congress passed the Trade and Tariff Act, which itself built upon and amended a prior Trade Act of 1974. The 1984 gave enhanced "fast-track" authority to negotiate bilateral free trade agreements, streamlining negotiations. In 1985, Canadian Prime Minister Mulroney agreed to begin discussions for the Canada-U.S. Free Trade Agreement. Negotiations began in 1986 and it was signed 1988. It went into effect on January 1, 1989, and remained in force until NAFTA replaced it. In 1990, Mexican President Carlos Salinas de Gortari requested a free trade agreement with the U.S. In 1991, Reagan’s successor, President George H.W. Bush, began negotiations with President Salinas for a liberalized trade agreement between the two countries. Before NAFTA, Mexican tariffs on U.S. imports were much higher than U.S. tariffs on Mexican imports. Canada also joined the discussions. In 1992, NAFTA was signed by outgoing President George H.W. Bush, Mexican President Salinas, and Canadian Prime Minister Brian Mulroney. Earlier that year, the European Union had been created by the Treaty of Maastricht. Concerns about the liberalization of labor and environmental regulations led to the adoption of two addendums. NAFTA was ratified by the legislatures of the three countries in 1993. The U.S. House of Representatives approved it by 234 to 200 on November 17, 1993. The U.S. Senate approved it by 61 to 38 three days later. President Bill Clinton signed it into law on December 8, 1993. It entered into force on January 1, 1994. Article 102 of the NAFTA agreement outlines its purpose. There are seven specific goals. Grant the signatories most-favored-nation status. Eliminate barriers to trade and facilitate the cross-border movement of goods and services. Promote conditions of fair competition. Provide protection and enforcement of intellectual property rights. Create procedures for the resolution of trade disputes. Establish a framework for further trilateral, regional, and multilateral cooperation to expand the trade agreement's benefits. NAFTA fulfilled all seven of its goals, establishing the region world’s largest free trade zone in terms of gross domestic product. It increased investment in the three countries. Until the last of its changes came into effect in 2008, it lowered or eliminated tariffs between the three countries and allowed trade to triple. Most important, it increased the competitiveness of the three countries in the global marketplace. Mexico's farmers were put out of business. Not enough environmental protections in Mexico. Free U.S. access for Mexican trucks. NAFTA has six major benefits in addition to these problems. In August of 2018, Trump and Mexico reached a bilateral trade deal to replace NAFTA, threatening to leave out Canada. Canada joined on September 30, 2018. The new deal is called the United States-Mexico-Canada Agreement. It must be ratified by each country's legislature. The Trump administration wanted to lower the trade deficit between the United States and Mexico. The new deal changes NAFTA in six areas, including a rule that auto companies must manufacture at least 75 percent of the car's components in the USMCA's trade zone or else be subject to tariffs. NAFTA was attacked from all sides during the 2008 presidential campaign. Barack Obama blamed it for growing unemployment. He said it helped businesses at the expense of workers in the United States. It also did not provide enough protection against exploitation of workers and the environment. During her campaign, Hillary Clinton called the agreement flawed. Both candidates promised to either amend or back out of the agreement altogether. Obama didn't fulfill these promises. In 2008, Republican candidate Ron Paul said he would abolish the trade agreement. He said it would create a "superhighway" and compared it to the European Union, though NAFTA does not enforce a single currency among its signatories. Paul maintained this position in his 2012 campaign. Republican nominee John McCain supported NAFTA, as he did all free trade agreements. In 1992, before the trade agreement was even ratified, Independent presidential candidate Ross Perot famously warned, "You're going to hear a giant sucking sound of jobs being pulled out of this country." Ross predicted that the United States would lose 5 million jobs to lower-cost Mexican workers, or 4 percent of total U.S. employment. Perot’s prediction never happened. While it's difficult to evaluate the impact of the trade agreement amid other factors, research suggests that NAFTA created more jobs than were lost.